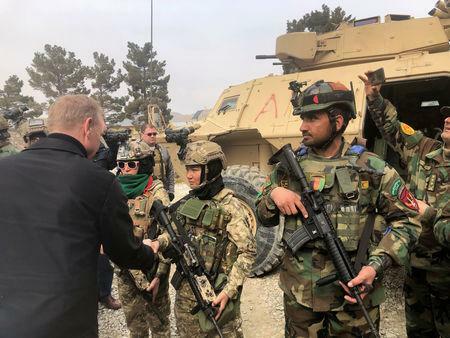 KABUL (Reuters) - Acting U.S. Defence Secretary Patrick Shanahan said on Monday it was important for the Afghan government to be included in talks to end the country's 17-year war, an involvement that the Taliban has so far rejected. Shanahan, making his first trip to Afghanistan in his new role, met U.S. troops and Afghan President Ashraf Ghani. He said he had so far not received any direction to reduce the nearly 14,000 U.S. troops in Afghanistan, but noted what he called strong U.S. security interests in the region. Ghani's government has been shut out of the peace talks between Taliban negotiators and U.S. envoys, with the hardline Islamist movement branding it a U.S. puppet. Kabul is concerned that a sharp drawdown of U.S. forces could lead to chaos in the region. 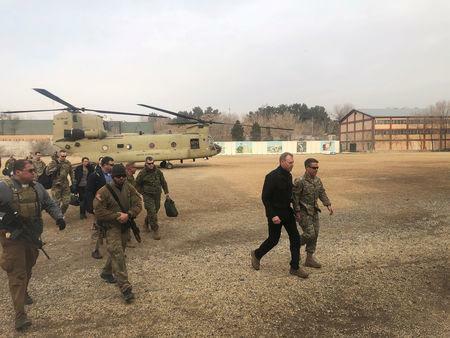 "It is important that the Afghan government is involved in discussions regarding Afghanistan," Shanahan told reporters traveling with him on the previously unannounced trip. "The Afghans have to decide what Afghanistan looks like in the future. It's not about the U.S., it is about Afghanistan." He said the aim of his trip was to get an understanding of the situation on the ground from commanders and then brief Trump on his findings. Shanahan's meeting with Ghani covered a range of defence issues important to the bilateral relationship, Pentagon spokesman Commander Sean Robertson said. That included "achieving a political settlement to the war that ensures Afghanistan is never again used as a safe haven from which terrorists can plan and launch terrorist attacks against the United States, our interests and our allies," Robertson said. Afghanistan and neighbouring countries are concerned about the effect of a sudden withdrawal of U.S. forces on the region. An Afghan official, speaking on the condition of anonymity, said even the suggestion of U.S. troops leaving was dangerous. "Of course it has given leverage to the Taliban, there is no question about that," the official told Reuters. Trump has offered no specifics about when he would bring home U.S. troops from Afghanistan but has said progress in negotiations with the Taliban would enable a troop reduction and a "focus on counter-terrorism". Shanahan said a withdrawal of about half the U.S. troops was not something that was being discussed. Khalilzad said after six days of talks with the Taliban in Doha last month that the United States and the Taliban had sketched the outlines for an eventual peace accord. He has said since then there has been progress on the future of U.S. troops in Afghanistan. The Taliban have put out contradictory information on what timeline the United States has agreed to in any potential withdrawal. Most recently, a Taliban official said no timetable had been agreed with the U.S. government. U.S. officials have told Reuters that while no formal orders have been sent, the military is preparing for what a withdrawal of about half of the U.S. troops in Afghanistan would look like. Officials have expressed concern that Afghan security forces, already stretched thin, could crumble if U.S. troops leave. Afghanistan’s special forces units suffered increasingly heavy casualties last year as the Taliban mounted major assaults on provincial centers including Ghazni and Farah in the southwest.